I used to think San Francisco's 977-foot Sutro Tower was impossibly tall. But it's just a stub compared to the Sky Tree, Japan's 2,080-foot tall communications centerpiece and the second tallest building on the planet, dwarfed only by the Burj Khalifa. 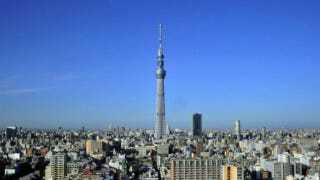 The Sky Tree is located in Sumida, Tokyo and cost $806 million to complete, which includes a two-month delay on account of the devastating earthquake and tsunami. Over half a million workers aided in its construction which concluded Wednesday.